From aggressive seagulls protecting their young, the mess, the health hazards and potential building damage caused by fouling pigeons, through to the loss of animal feed and seed to flocks of smaller species, the problems caused by birds can have a real impact on businesses. Falcon Pest Control will carry out a free survey to ascertain the problem and offer a wide range of deterrent and proofing solutions. We offer discreet methods of pigeon and seagull control that are effective and won’t affect the running of your business. 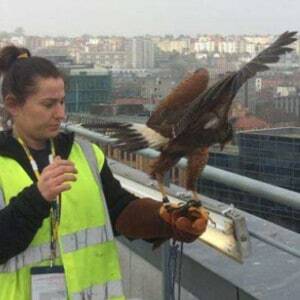 Our avian technicians have over 20 years’ experience in bird control and bird proofing solutions and understand and adhere to the current legal requirements when dealing with any bird species. Hawking: As our name suggests, at Falcon we often deploy birds of prey to deter nesting. This deterrent method works because the intimidation of the prey bird scatters the pest birds high to avoid attack. It is an eco-friendly, effective method that works best through a regular programme of visits that causes the birds to abandon certain roosts or areas. It is ideal for areas that have limited access or fragile roof structures. Scaring: Falcon offer acoustic solutions to nesting gulls and wintering starlings. These include distress sound recordings which inhibit birds nesting at certain sites. This is available as a permanent device or on a hire basis. 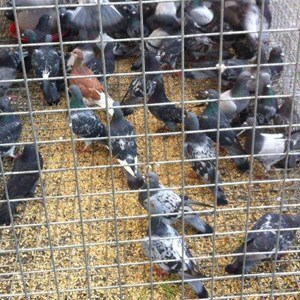 Pigeon Traps: A humane method in which feeding bait stations are placed within traps to attract the pigeons; retaining at least one pigeon in the trap will encourage others. Food & water must be checked every day to ensure the wellbeing of the birds. Gull Nursery Clearance: In some cases, where gulls have become used to a nesting site or they are showing aggressive behaviour, disruption of the egg laying cycle and nesting sites may be necessary and, in the most extreme cases egg removal may be the appropriate course of action. Nest Boxes: For protected species, we can supply and fit nesting boxes to encourage nesting away from your premises.